David Hallyday ( #24 PSI C5-R) was quickest initially, while Bruno Hernandez (#9 ANAVEO Oreca Saleen S7R) was having a spin, without incurring any damage. The drivers were warming up their tyres for several laps, before the first significant lap times. Jean-Claude Lagniez (#12 Mirabeau Viper) was first to improve, then Hallyday, Lebon (#27 SRT C5-R), Lesoudier (#29 Red Racing Lister Storm), Soave (#26 SRT C5-R) and Fiat (#3 Protek Saleen S7R), improved too. Bruno Hernandez moved up to second position, then took pole on his last flying lap – with Hallyday second quickest, from the impressive Kuismanen (#25 PSI C6.R), Lebon, Soave, Fiat, Peyroles (#5 First Racing Viper) and Bornhauser (#1 VBM Viper). In the GT2 Trophy, Narac (#36 IMSA PORSCHE 996 RSR) was dominating, again, and ended his session after just ten minutes. 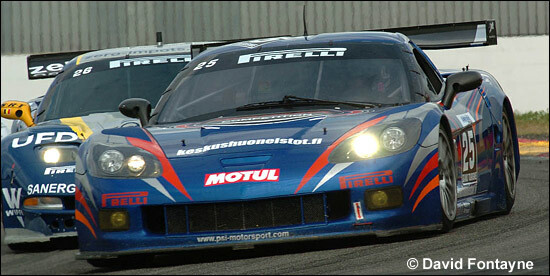 He was quickest, ahead of Claude Monteiro (#37 Estoril Racing Porsche 996 RSR) and Mouez (#38 Protek Porsche 911 GT3 RS). Bruno Hernandez was the best starter, ahead of Hallyday, Soave and Bornhauser, who made a really good start from the fourth row. Hallyday was pressuring Hernandez in the Saleen, and on the third lap he succeeded in taking the lead of the race. Three pairings were fighting hard – Hallyday and Hernandez for first place, Soave and Kuismanen for third position, and Bornhauser and Lebon for fifth. Their pursuers were led by Balthazar’s Larbre Ferrari 550 Maranello which was ahead of Fiat, Peyroles and Blanchemain (#11 Euroflash Autovitesse Viper). Hallyday widened the gap on Hernandez; while Kuismanen passed Soave, then Hernandez for second place, so the two PSI Experience Corvettes were in the top two positions. After fifteen minutes, most of the cars pitted for the driver changes. However PSI chose a different strategy, Kuisman and Hallyday pitting a little later on. Philippe Alliot actually took over later than most because the radio in his new helmet didn’t work, so he stayed on the track a lap more than scheduled. After the driver changes, Alliot (#24 PSI C5-R) was in the lead but very soon Palttala (#25 PSI C6.R) and Ayari (#9 ANAVEO Oreca Saleen S7R) caught up with him. Palttala (along the finish straight), then Ayari (in the Point Corner) passed him. Bouchut (#27 SRT C5-R) was fourth. Dumez (#11 Euroflash Autovitesse Viper) was outstanding, moving up from tenth to sixth place. Palttala was not concerned by Ayari’s speed and widened the gap in the later stages. The Finnish pairing ended up comfortable winners, by three seconds, ahead of Ayari / Hernandez and Alliot / Hallyday. Bouchut / Lebon and Policand / Balthazard (fifth) also scored good points.